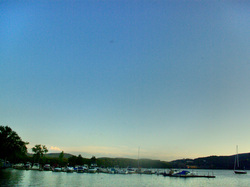 We offer a wide range of tours that accommodate all levels of proficiency and highlight the beautiful Hudson Highlands. From challenging day tours to meandering moonlight paddles, yoga on land and water, nature and history appreciation, and watching fireworks burst over the Hudson River, we have something for everyone. All tours include: Boat rental, paddle, water, and a PFD. 4-hour tours also include: A variety of cheeses, cured meats, breads, hummus, veggies, and fruit provided by Cold Spring General Store. Please let us know if you have any food restrictions when booking your tour. See the list below for a description of our tours and our schedule for a full Peekskill calendar. We will add new tours throughout the season, so keep in touch to see our recent additions! We continually add more tours throughout the season. ​Check back soon for new opportunities to get on the water! This tour heads north to the southern gates of the Hudson Highlands - Dunderburg Mountain, Anthony's Nose, and Bear Mountain. We go up to the rocky shoal of Fish Island and then cross over to Round and Iona Islands. Paddling on the open river provides a sense of adventure as we journey around these islands that dot the Hudson. Experience traveling through the southern gates of the Hudson Highlands Region - Dunderburg Mountain, Anthony's Nose, and Bear Mountain from the unique perspective of the river. We launch from our dock at the Annsville CreekPaddle Sport Center. The route will lead north to Popolopen Creek just beyond the Bear Mountain Bridge. We will land just inside the mouth of Popolopen Creek where we take a break, refresh, and refuel. As a bonus, our break location is at the foot of the short trail which leads to the Fort Montgomery historical site and Revolutionary War interpretive center. See the city of Peekskill from a new vantage point. Paddle from our lagoon into Peekskill Bay on the Hudson River. Come with us on a leisurely paddle that meanders through Annsville Creek. An opportunity to get on the water and experience the area's allure in a different light. Either the glow of a moon or an array of stars will light your way during a calm and peaceful paddle. This is a short duration tour with the destination less of a concern. The aim of a collectively enjoyed experience and the tides will determine the float plan. Another chance to round-out a land and water day-plan or slip away from an otherwise full schedule. Encouraged for paddlers of all skill levels. 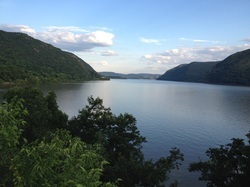 Experience the grandeur of the Hudson Highlands during this one-way tour with spectacular views from Peekskill Bay, past Anthony's Nose and Bear Mountain, and through the gate of Breakneck Ridge and Storm King mountain. The paddle demands a commitment to push through to the destination and provides a great sense of accomplishment at the end of the 4-hour journey. Shuttle service is provided from the destination. Please include your shuttle time when planning post-paddle activities. ​From our family to yours, we are proud to offer you our Family Excursion! With special pricing and on-water supervision in both our locations, we have created a family-centered introduction to paddling! Our Family Excursion includes on-land and on-water portions to promote safety for paddlers of all ages. The on-land portion of this Family Excursion includes guidance on how to safely wear a lifevest, proper boat-fitting, basic paddle instruction and safety communication. The on-water portion includes use of our single kayaks, tandem kayaks, or canoes (please choose when booking), and on-water supervision by our staff in our beautiful Lagoon in Peekskill while you enjoy paddling. ​Combining the complementary exercises of yoga and kayak paddling creates a balance between land and water. Renowned instructor, Lauri Nemetz, is a pioneer of this integration. There are various destinations including sunset tours, World's End, Fort Montgomery (Peekskill schedule), Constitution Marsh, and more. Click on each date on our schedule page under the "Home" tab to see the location for each date. Interested in creating an experience for your own group of friends, family, clients, or a corporate retreat? We can schedule a private tour exclusively for your crew of paddlers. A minimum of 6 participants applies. You can choose from this list of tours or tailor a day or evening to your interests and abilities. Talk to us. We'd love to help make your idea happen. A fun new way to connect with nature and your troop. 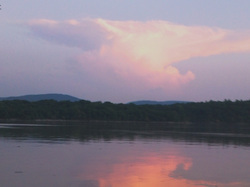 We have paddling, hiking, and mindfulness options to earn a Hudson River Expeditions patch! Email us at crew@HudsonRiverExpeditions.com to learn more and book your adventure.